The issues arising out of conflicting maritime territorial claims in the South China Sea have been the object of intense public discourse amongst the global maritime experts, strategists, academicians and the media over the past two years. While the overlapping maritime zones consequent to the sovereignty rights over the Paracel and Spratly group of Islands – mainly between China, Vietnam and Philippines – have been an issue of discord for over half a century, these issues have seen renewed focus and traction since May 2009. The date assumes significance as the United Nations Commission on ‘Limits of the Continental Shelf’ (CLCS) set a deadline of May 2009 for the states to submit their extended continental shelf claims. This deadline, in a manner of speaking, may be considered to have been instrumental in making China formally commit to the extent of its maritime zones claim in the South China Sea. China attached a diagram in its May 7, 2009 communication to the UN CLCS, wherein its claim encompassed virtually the entire South China Sea, leaving very little maritime space to the other littorals. 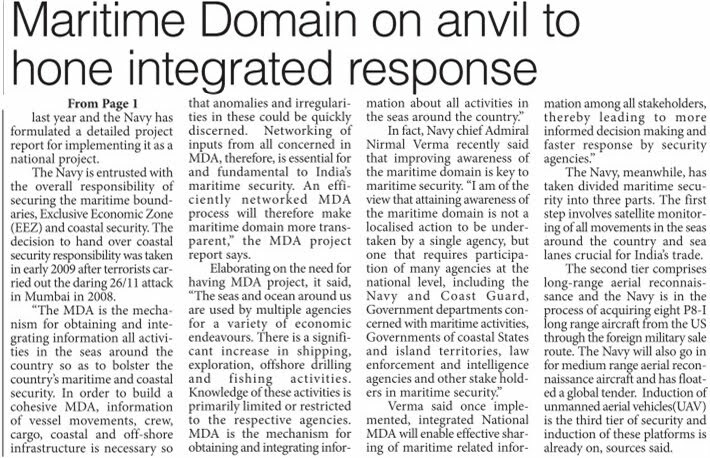 Thereafter, China began to assert its claim by conducting such maritime activities as policing, patrolling, surveillance, fishery control, deep sea research, mineral and oil prospecting. The 2002 Declaration on the Code of Conduct (DOC 2002) between China and the other parties to the South China Sea dispute provided some sort of latitude for China to continue with the above activities, all the while maintaining that it was interested in ‘peace and stability’ in the region. The other parties to the dispute were rendered relatively inactive by the growing Chinese national power, manifestation of the same in their maritime zones and a clause in the DOC 2002 advising all parties to "resolve the territorial and jurisdictional disputes without resorting to threat or use of Force". The wilful obstruction of US Navy research ship Impeccable while it was carrying out undersea military survey, promulgation of fishing ban and its subsequent enforcement, planting of the Chinese flag deep into the seabed and above all, elevating the issue to the level of ‘core interest’, brought home the serious intent of China as regards the South China Sea, in stark relief.The current sequence of events commencing May 26, 2011 have raised the pitch of the dispute to a level where the world at large has actually begun to wonder whether the issue can remain regional anymore. On that day, the maritime security vessels of China cut the outboard cables of a Vietnamese oil exploration ship Binh Minh. This set off a series of confrontational interludes between the two countries over the next two weeks. Vietnamese live fire maritime exercise, conducted on June 11, 2011 against such a tenuous backdrop caused additional alarm. During the Shangri La Dialogue in June 2011, the US took a position that "the maritime security remains an issue of particular importance for the region" and followed it up by passing a resolution in the US Senate on June 27, 2011, calling for "a peaceful and multilateral resolution to maritime territorial disputes in South East Asia", deploring the use of force by naval and maritime security vessels from China in the South China Sea, and supporting the continuation of operations by the US armed forces to enable the freedom of navigation in international waters and air space in that Sea. The ASEAN foreign ministers came up with new draft guidelines on the implementation of the DOC 2002 during the Bali meeting, preparatory to the ASEAN Regional Forum (ARF) meet. In a joint communiqué issued on July 19, 2011 they stated that "they looked forward to the finalisation of the same during the upcoming ASEAN-China senior officials’ meeting". Two days later, Yang Jiechi, the Foreign Minister of China showed positive outlook while guidelines were unanimously adopted, by stating that these guidelines are a milestone for cooperation between China and the ASEAN countries. He quoted a Chinese saying to the effect that "a thousand mile journey begins with the first step", to emphasise its importance. Though the guidelines have no independent standing of their own, do not add any new issues to those mentioned in the DOC 2002, do not address any operational confidence building measures to reduce immediate tensions and are meant merely to reiterate the serious implementation of the same, the very fact that they have been accepted formally by China is seen by ASEAN states as a sign of eventual positive outcome. The US and other participants of the ARF and the East Asia Summit welcomed the ASEAN-China forward momentum post the joint adoption of the guidelines and all parties appear to be reasonably pleased with the outcome for the time being. 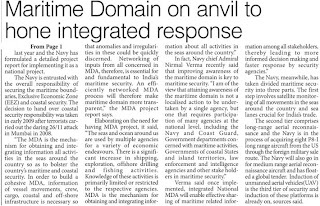 However, the core issues of sovereignty and associated maritime zones in the South China Sea remain untouched. Therefore, the global community and the South China Sea littorals in particular, would do well to understand the subtle message about the longevity of the issue, brought home so aptly by the Chinese Foreign Minister through the above Chinese saying. New Delhi, August 7 The Supreme Court has thrown out the bail petition of an Army Major, accused of killing his wife in Kolkata’s Thakur Pukur cantonment area three months ago. The victim was allegedly killed within a week of joining her husband from Shimla. The marriage had taken place 12 years ago. A Bench comprising Justices HS Bedi and Gyan Sudha Misra dismissed Major Krishankant Dwivedi’s petition seeking quashing of the Calcutta High Court order cancelling the anticipatory bail granted by a lower court. The apex court Bench virtually snubbed his counsel for approaching it instead of asking his client to join the investigation. Since the medical board had found that the cause of death of Manju Dwivedi was asphyxia there was no question of the apex court intervening in the case, Justice Bedi observed. A Division Bench headed by Chief Justice Jainarayan Patil of the HC had also reprimanded the trial court for the “arbitrary” use of judicial discretion even before the police had begun the investigation. Manju’s father, Dr LN Negi, had approached the HC seeking justice. According to Negi, local Army authorities are putting all sorts of “obstacles” in the investigation despite the matter being reported to Defence Minster AK Antoy and GoC Eastern Command Lt Gen Bikram Singh. The alleged murder had taken place on the night of May 8/9 in the staff quarters of 1831 Light Regiment when the accused and the victim were alone. The HC had, in its July 19 order, recorded that it had “very carefully gone through the opinion of the medical board” which prima facie indicated that the victim had been asphyxiated by applying pressure “over the neck by broad, soft, flexible object.” This clearly went against the contention of the accused that Manju had committed suicide by consuming poison. “In our considered view, it was not proper on the part of learned Sessions judge in-charge to have directed the respondent/accused to allow pre-arrest bail as it is not a case where custody of the accused is not required for the purpose of the investigation,” the HC had said. The HC also directed Maj Dwivedi to surrender to the police within 14 days and transferred the case to the Crime Investigation Department of the West Bengal Police as the local police had failed to subject the accused to custodial interrogation. During the 14-day time for surrender, the HC had asked Maj Dwivedi to report daily at Bishnupur police station. According to the victim’s father, the accused was going to the police station escorted by four to five army personnel, effectively preventing custodial interrogation. Kabul: Afghan and American forces battled insurgents today in the region where the Taliban shot down a US Army Chinook helicopter a day earlier, killing 30 US troops and eight Afghans. The fighting was taking place as NATO began an operation to recover the remains of the large transport helicopter that was shot down by insurgents early Saturday in the Tangi Joy Zarin area of Wardak province's Sayd Abad district, about 60 miles (97 kilometers) southwest of Kabul. The clashes today did not appear to involve the troops around the crash site. "There have been a small number of limited engagements in the same district as yesterday's helicopter crash, however those clashes have not been in the direct vicinity of the crash site," NATO said in a statement. "As of now, we have no reporting to indicate any coalition casualties resulting from these engagements." Wardak provincial spokesman Shahidullah Shahid confirmed the helicopter recovery mission was under way and said there were reports of Taliban casualties overnight. "There is a joint operation going on by Afghan and NATO forces. A clearing operation is ongoing in the district and there are reports of casualties among insurgents," Shahid said. "The area is still surrounded by American forces." Elsewhere in Afghanistan, NATO said insurgents killed four alliance service members in two separate attacks in the east and the south. It did not provide their nationalities or any other details. Defence spending is precisely what it says on the tin: spending to defend this country. So before you get too deep in scrapped aircraft carriers, slashed regiments et al, answer the question on the other side of the label. What is the threat we're defending ourselves against? Who's coming to get us? And here's where the debate – whether led by old sea dogs short of a Harrier or now, the relevant Commons' select committee – grows foggy, going on totally impenetrable. We aren't convinced that our "armed forces will maintain the capability to undertake all that is being asked of them", say the MPs. Well, ask for less … Are we, pliant planters of the Nato flag anywhere in the world the Pentagon prescribes, going to get involved in another Iraq – or, worse, another Afghanistan? Of course not, says bitter experience. Even America, saving its trillions, can't be so foolishly heedless. Thirty-one more servicemen dead in a single helicopter make a savage point. There is no winning or losing in far foreign fields. Tea Party blackmail and S&P ratings are the real enemies now. Modest ventures – say, bombing Libya's coast roads to stop too much slaughter – are probably off any future agenda, too. The cash we pay for such minor "defence" operations – counted in millions rather than the billions NHS computers lose – isn't enough to keep planes in the air day after day without top brass wailing that they need more. Simply: saving lives in Libya is the most modest kind of out-of-area task you could envisage. If we can't do that without calling for Wing Commander Twist, then forget it. Leave the Libyans to a Syrian fate. Park consciences, wash hands. Come back to fortress Europe. Who, looking round there with due solemnity, is going to start attacking the UK any time soon? Iceland, France, Germany? Ah! The old Muscovite hordes are on the march, are they? Give me one believable scenario that makes sense. There could be trouble in the Balkans, of course. (And no, vice-admiral, I haven't forgotten the Falklands). But the only true threat, if any, is terrorism, again; with maybe a pinch of Tottenham-fuelled civil disorder and a spoonful of Northern Ireland thrown in. Does that need £25bn a year? Does it need heavy tanks, nuclear subs and Eurofighters? Both the bill and the shopping list are wholly out of proportion. Indeed, they are only proportionate if you conjure up a wild menu of threats that would, lumped ludicrously together, demand huge extra capacity. Only two strands of debate support such a conclusion. One is the bog-standard MoD concern that cuts mean fewer chaps on the ground and fewer billions to spend. The other is that we shall lose "global influence". Cue the departing US defence secretary, Robert Gates, and his warning that America can't do all the world's "heavy lifting" alone. But Gates, at the CIA, was a main proponent of the hollow "Soviet threat". He was big on Saddam threats and Taliban threats, as well. He's an intervener and cheque signer from the days when America poured zillions into "defence" because that was its role – and what its defence industries demanded. Be clear today, though, that this era is past. Be clear that defence spending is what we need to spend – not what the heavy lifters say might be useful. And be clear, too, about the Tripoli dither. If £25bn can't set bombing waves pounding over a few months without second thoughts and escalating cost demands then there's no point in "asking" for such operations any more. And, equally, no point in providing the cash for them. No threat; no action; no argument. There has been a spurt in infiltration attempts by militants into Kashmir ahead of the onset of winter with army foiling nearly a dozen such bids at the Line-of-Control (LoC) in less than a fortnight. The increase in infiltration attempts comes in the backdrop of the Kashmir Valley remaining relatively peaceful this summer. 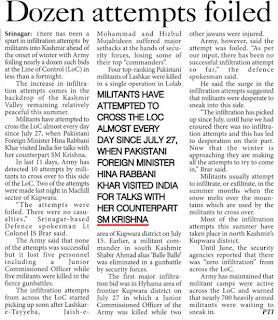 Militants have attempted to cross the LoC almost every day since July 27, when Pakistani Foreign Minister Hina Rabbani Khar visited India for talks with her counterpart SM Krishna. In last 11 days, army has detected 10 attempts by militants to cross over to this side of the LoC. Two of the attempts were made last night in Machill sector of Kupwara. "The attempts were foiled. There were no casualties," Srinagar-based Defence spokesperson Lt Colonel JS Brar told PTI. The army said that none of the attempts was successful but it lost five personnel including a junior commissioned officer while five militants were killed in the fierce gunbattles. The infiltration attempts from across the Line of Control started picking up soon after Lashkar-e-Taiba, Jaish-e-Mohammad and Hizbul Mujahideen suffered major setbacks at the hands of security forces, losing some of their top "commanders". Four top-ranking Pakistani militants of Lashkar were killed in a single operation in Lolab area of Kupwara district on July 15. Earlier, a militant commander in south Kashmir Shabir Ahmad alias 'Balle Balle' was eliminated in a gunbattle by security forces. The first major infiltration bid was in Hyhama area of frontier Kupwara district on July 27 in which a Junior Commissioned Officer of the army was killed while two other jawans were injured. Army, however, said the attempt was foiled. "As per our input, there has been no successful infiltration attempt so far," the defence spokesperson said. He said the surge in the infiltration attempts suggested that militants were desperate to sneak into this side. "The infiltration has picked up since July, until June we had ensured there was no infiltration attempts and this has led to desperation on their part. Now that the winter is approaching they are making all the attempts to try to come in," Brar said. Militants usually attempt to infiltrate, or exfiltrate, in the summer months when HE snow melts over the mountains which are used by the militants to cross over. 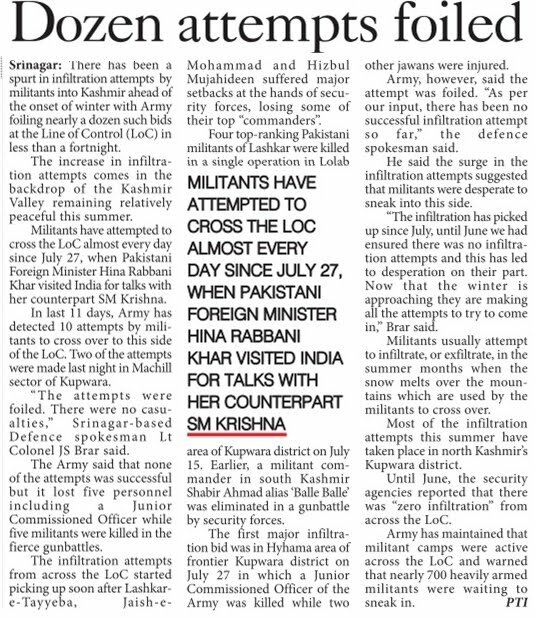 Most of the infiltration attempts this summer have taken place in north Kashmir's Kupwara district. Until June, the security agencies reported that there was "zero infiltration" from across the LoC. Army has maintained that militant camps were active across the LoC and warned that nearly 700 heavily armed militants were waiting to sneak in. New Delhi: In a bid to have more women officers in defence forces, the government is set to approve an exclusive Sainik (military) School for girls. Madhya Pradesh may host the educational institution. A Defence Ministry official said that the proposal for the school, under the auspices of the Army Educational Corps, is "at a mature stage" and it could help encourage girls to aspire for a career in the armed forces. "A proposal from the Madhya Pradesh government to allot land in Sagar district and to host the girls Sainik School has reached us," the official said here. "Since the process involves a lot of financial approvals, it may take three to four years before the school starts. First, we will get the land transferred from the state government to the Defence Ministry and then the school infrastructure will be developed," the official said. Sainik Schools Society, hitherto an exclusive boys’ educational institutions organisation, were established in 1961 as a joint venture of the central and state governments. Its objective is to bring quality public school education to the common man, besides removing regional imbalance in the officers' cadre of the armed forces, according to a parliamentary committee report submitted to the Lok Sabha recently. There are 24 such schools in India now. Joining National Cadet Corps (NCC) is compulsory for their students up to Class 12. "Though there are no shortages in the number of women officers in the armed forces, the school is an idea whose time has come," the official said. Of the total 5,137 women short service commission officers, 4,101 are in the Army, 784 in the Air Force and 252 in the Navy. These apart, there are permanent commissioned officers in the Army's medical and dental corps and their equivalents in the Navy and Air Force, apart from those in the military nursing services. Women officers in the Indian Army serve in supporting roles such as ordnance, signals, supply and electronic and mechanical engineers corps. In the Indian Air Force, women serve in all streams except as fighter pilots. In the Navy too, they serve in all the streams but can't be posted on board ships and submarines that go out to sea. The women are usually recruited in short service up to 14 years, but the government has a couple of years ago decided to offer them permanent commission in select streams such as education, legal and other support services of the armed forces. From the euphoria of high office to a jarring reality check, Air Chief Marshal Norman Anil Kumar Browne traversed many emotions within a week of taking over as the chief of the Indian Air Force. Barely had he settled into his office on August 2 came news of the aging MiG-21s claiming another pilot's life. Two days later, another pilot died in a Jaguar crash. Browne is no stranger to crashes. He's been in the inherently-dangerous business of military aviation for 39 years and has notched up over 3,100 hours of flying. But when Browne was tearing into the skies in a MiG-21 in his youth, he could hardly have imagined that even by the time he became the IAF chief, India's first-ever supersonic fighters would still be around. The IAF may be the world's fourth largest air force, after the US, Russia and China, but virtually half its combat fleet is made up of obsolete fighters like MiG-21s and MiG-27s. Plus, it's dogged by huge operational and maintenance problems. Its helicopter fleets, air defence systems and radars are no better. Successive governments have failed to build India's military capabilities in tune with its expanding geopolitical objectives. Little has also been done to create a strong domestic defence-industrial base, forcing India to become one of the world's largest arms importers. After the 1999 Kargil conflict and Operation Parakram of 2002 exposed gaps in operational capabilities, India inked a flurry of arms deals worth over $50bn over the last decade, most with gleeful foreign armament majors. More than double that amount will be spent this decade. IAF is now keeping its fingers crossed on its various modernization plans coming good. Browne has played a key role in steering them - like the $10.4bnMMRCA project - during his stint as the IAF deputy chief. Now he feels confident enough to proclaim that the "IAF is well poised on the path of transforming itself into a potent strategic force". Transform, IAF will have to. With older MiG variants being progressively phased out and new inductions coming in fits and starts, it has been in a freefall for a long time as far as the strength of its fighter squadrons (each with 14-18 jets) is concerned. The number of squadrons dipped to just 28 (sanctioned strength is 39.5) in the recent past. Senior officers say it'll not be before 2020 that the IAF manages to reach this "sanctioned strength" of 39.5 fighter squadrons. "This, when for long we have held that a minimum of 45 fighter squadrons are required to meet the twin-threat from Pakistan and China,'' says an officer. The air combat ratio with Pakistan, in fact, has declined to such an extent that a previous IAF chief, Air Chief Marshal S P Tyagi, was forced to warn the UPA government that "unless immediate steps are taken to arrest the reduction in IAF's force levels, the nation will for the first time in its history lose the conventional military edge over Pakistan''. To add to the woes, apart from swanky new advanced F-16s from the US, Pakistan is also on course to get as many as 250 JF-17 'Thunder' fighters plus a squadron or two of J-10B jets from China. China, meanwhile now has five fully-operational airbases in Tibet, with more coming up. With the Chinese Sukhoi-27UBK and Sukhoi-30MKK fighters having practiced operations from there in recent times, India remains the target. The IAF has begun to base its Sukhoi-30MKIs in the north-east, with Chabua following Tezpur, apart from upgrading airstrips and helipads along the LoC in a bid to counter China. But the progress is slow. Browne will have to ensure that modernization plans remain on track and that operational capability is enhanced. "Operating across a broad spectrum of equipment vintage would test our capabilities,'' he admits. IAF wants to transform into a fully-networked aerospace power, with a clear footprint from the Persian Gulf to Malacca Strait. Much like the central protagonist in the famous 'Peanuts' comic strip, "Charlie Browne'' (the IAF chief's nickname) will have to press on, regardless of the odds.